(1) S'rî S'uka said: 'Oh King, there was a very big mountain countless miles high, known as Trikûtha ['three peaks']. It was surrounded by an ocean of milk [or plant-juice see 5.20: 18]. (2-3) With its three peaks full of silver, iron and gold in its circumference being as wide as it was long, it, as an island, lush with trees, creepers and shrubs and the sounds of waterfalls, stood radiant against the sky in every direction, with even more peaks on all sides containing precious stone and minerals. (4) At its foot, being washed by the waves of the sea all around, the earth had turned dark green from green emerald stones. (5) The souls of perfection, the venerable souls, the heavenly singers, the souls of knowledge and the great souls of the world of snakes, the souls of a superhuman nature and the dancing girls, enjoyed it in the valleys there to be engaged in pastimes. (6) The caves there resounded with the sounds of singers, that made the stout lions enviously roar for a mate. (7) The dales harbored great numbers of all thinkable jungle animals and the gardens, that were tended by the enlightened souls living there, were beautifully decorated with all types of trees and chirping birds. (8) In the rivers and lakes filled with crystal clear water, the damsels of the godly souls were bathing who, [entering the water] at the sand banks glittering with gems, enriched the air and the water with the fragrance of their bodies. (9-13) In one valley there was a garden of the great soul, the mighty personality of Varuna, that was named Ritumat. it was a sporting place of the Sura ladies that everywhere, to honor the divinity, was most beautifully tended with flowers and fruits and mandâra and pârijâta, pâthala, as'oka and campaka trees. There were fruits like cûtas, piyâlas, panasas, mangoes, âmrâtakas, kramukas and pomegranates as also coconut and date trees. One found there madhukas, palm trees, tamâlas, asanas, arjunas, arishthas, udumbaras, plakshas, banyans, kims'ukas and sandelwood trees as also picumarda flowers, kovidâra fruits, sarala- and sura-dâru trees, grapes, sugar cane, bananas, jambu, badarî, aksha, abhaya and âmalakî fruits. (14-19) In that garden there was a very large lake, full of shining golden lotuses, surrounded by bilva, kapittha, jambîra, bhallâtaka and other trees. Next to the great beauty of the kumuda, kahlâra, utpala and s'atapatra flowers, the intoxicated bees were humming around accompanied by the most melodious songs of the birds. It was crowded with swans and kârandavas, cakrâvakas, flocks of water chickens, koyashthis and dâtyûhas who all made their noises. The water, surrounded by kadamba, vetasa, nala, nîpa and vañjulaka flowers, agitated by the movements of the fish and tortoises, stirred the lotuses, so that the pollen falling from them covered the surface. The trees growing on the banks, like kundas, kurubakas, as'okas, s'irîshas, kûthajas, ingudas, kubjakas, svarna-yûthîs, nâgas, punnâgas, jâtîs, mallikâs, s'atapatras, mâdhavî-latâs, jâlakâs and others, adorned the place [bearing fruits and flowers] abundantly during all seasons. (20) The leader of the elephants, who in the company of his wives lived in the forest, one day wandered around on that mountain and [searching for water] broke through many thickets full of thorns, creepers and all kinds of trees and plants. (21) Just his smell was enough to make all the lions and other beasts of prey, the other elephants, the rhinoceroses, big snakes and the white and black camarî deer flee in fear. (22) By his mercy the foxes, boars, buffaloes, bears, porcupines, gopucchas and other deer, wolves, monkeys and small animals like rabbits and such, could freely roam without fear. (23-24) Dripping from his temples and agitated [in musth] he, surrounded by intoxicated, drinking bees and followed by the other he and she elephants and the young in their midst, made the earth all around the mountain tremble. From a distance smelling the water with the pollen of the lotus flowers carried by the breeze he, with his thirsty company and his vision clouded under the influence, hurried for the bank of that lake. (25) Entering its pellucid, cool water he with his trunk drank his fill from the nectarean lotus pollen mixture, took a good bath and was thus relieved of all fatigue. (26) Drawing the water with his trunk and spraying it over him, he inspired his wives and children also to take a bath and drink. Thus being engaged he, like a concerned householder being overly attached to his family, took under the control of the deluding material world, no heed of any possible danger. (27) Then the lot fell to him that his foot, oh King, right there was caught by a mighty and angry crocodile. The elephant thereupon with all his strength strenuously tried to get out of this dangerous position. (28) When the wives saw that their leader was suddenly attacked and captured, they in shock started to lament. But the other elephants trying to free him from behind, were equally helpless. (29) While the elephant and the crocodile this way were fighting, pulling one another in and out of the water, a thousand years passed in which they both stayed alive. That, oh King, was a thing the immortal souls considered most wonderful. 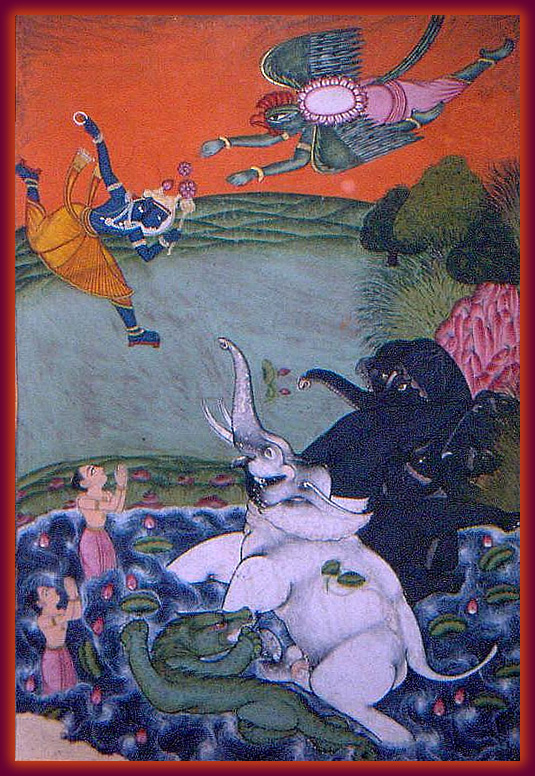 (30) Gajendra, the elephant king, in the period thereafter more and more lost his strength because of the fatigue of having fought so long against being pulled into the water. The crocodile by contrast, was at home in the water and became more frantic, strong and powerful over the years. Third revised edition, loaded April 20, 2019. S'rî S'uka said: 'Oh King, there was a very big mountain countless miles high, known as Trikûtha ['three peaks']. It was surrounded by an ocean of milk [or plant-juice see 5.20: 18]. With its three peaks full of silver, iron and gold in its circumference being as wide as it was long, it, as an island, lush with trees, creepers and shrubs and the sounds of waterfalls, stood radiant against the sky in every direction, with even more peaks on all sides containing precious stone and minerals. At its foot, being washed by the waves of the sea all around, the earth had turned dark green from green emerald stones. The souls of perfection, the venerable souls, the heavenly singers, the souls of knowledge and the great souls of the world of snakes, the souls of a superhuman nature and the dancing girls, enjoyed it in the valleys there to be engaged in pastimes. The caves there resounded with the sounds of singers, that made the stout lions enviously roar for a mate. The dales harbored great numbers of all thinkable jungle animals and the gardens, that were tended by the enlightened souls living there, were beautifully decorated with all types of trees and chirping birds. In the rivers and lakes filled with crystal clear water, the damsels of the godly souls were bathing who, [entering the water] at the sand banks glittering with gems, enriched the air and the water with the fragrance of their bodies. In one valley there was a garden of the great soul, the mighty personality of Varuna, that was named Ritumat. It was a sporting place of the Sura ladies that everywhere, to honor the divinity, was most beautifully tended with flowers and fruits and mandâra and pârijâta, pâthala, as'oka and campaka trees. There were fruits like cûtas, piyâlas, panasas, mangoes, âmrâtakas, kramukas and pomegranates as also coconut and date trees. One found there madhukas, palm trees, tamâlas, asanas, arjunas, arishthas, udumbaras, plakshas, banyans, kims'ukas and sandelwood trees as also picumarda flowers, kovidâra fruits, sarala- and sura-dâru trees, grapes, sugar cane, bananas, jambu, badarî, aksha, abhaya and âmalakî fruits. In that garden there was a very large lake, full of shining golden lotuses, surrounded by bilva, kapittha, jambîra, bhallâtaka and other trees. Next to the great beauty of the kumuda, kahlâra, utpala and s'atapatra flowers, the intoxicated bees were humming around accompanied by the most melodious songs of the birds. It was crowded with swans and kârandavas, cakrâvakas, flocks of water chickens, koyashthis and dâtyûhas who all made their noises. The water, surrounded by kadamba, vetasa, nala, nîpa and vañjulaka flowers, agitated by the movements of the fish and tortoises, stirred the lotuses, so that the pollen falling from them covered the surface. The trees growing on the banks, like kundas, kurubakas, as'okas, s'irîshas, kûthajas, ingudas, kubjakas, svarna-yûthîs, nâgas, punnâgas, jâtîs, mallikâs, s'atapatras, mâdhavî-latâs, jâlakâs and others, adorned the place [bearing fruits and flowers] abundantly during all seasons. The leader of the elephants, who in the company of his wives lived in the forest, one day wandered around on that mountain and [searching for water] broke through many thickets full of thorns, creepers and all kinds of trees and plants. Just his smell was enough to make all the lions and other beasts of prey, the other elephants, the rhinoceroses, big snakes and the white and black camarî deer flee in fear. By his mercy the foxes, boars, buffaloes, bears, porcupines, gopucchas and other deer, wolves, monkeys and small animals like rabbits and such, could freely roam without fear. Dripping from his temples and agitated [in musth] he, surrounded by intoxicated, drinking bees and followed by the other he and she elephants and the young in their midst, made the earth all around the mountain tremble. From a distance smelling the water with the pollen of the lotus flowers carried by the breeze he, with his thirsty company and his vision clouded under the influence, hurried for the bank of that lake. Entering its pellucid, cool water he with his trunk drank his fill from the nectarean lotus pollen mixture, took a good bath and was thus relieved of all fatigue. Drawing the water with his trunk and spraying it over him, he inspired his wives and children also to take a bath and drink. Thus being engaged he, like a concerned householder being overly attached to his family, took under the control of the deluding material world, no heed of any possible danger. Then the lot fell to him that his foot, oh King, right there was caught by a mighty and angry crocodile. The elephant thereupon with all his strength strenuously tried to get out of this dangerous position. When the wives saw that their leader was suddenly attacked and captured, they in shock started to lament. But the other elephants trying to free him from behind, were equally helpless. While the elephant and the crocodile this way were fighting, pulling one another in and out of the water, a thousand years passed in which they both stayed alive. That, oh King, was a thing the immortal souls considered most wonderful. Gajendra, the elephant king, in the period thereafter more and more lost his strength because of the fatigue of having fought so long against being pulled into the water. The crocodile by contrast, was at home in the water and became more frantic, strong and powerful over the years. 'Neither all these relatives can deliver me from my distress, nor can I as an elephant expect to be freed by my wives from this fate of being captured tightly by the crocodile [of passion]. I, just like anybody else, therefore have to take shelter of Him who is the transcendence and the refuge of the most exalted souls [compare 7.9: 18]. Additional prints of the Krishna Darshan Art Gallery.